There are great places to hear music, and then there are the sacred spaces—the cathedrals of Europe, Buenos Aires’ Teatro Colon, Barcelona’s art icon La Palau De Musica Catalanya, Manhattan’s Carnegie Hall. In the rock era, venerated venues have less to do with pristine acoustics or architectural grandeur than the musical history that took place at, say, Liverpool’s Cavern Club, the Fillmores East and West, or the Apollo Theater. But only a rare few combine the magic and the music, the soul and the sound. One of the truly great ones is Nashville’s Ryman Auditorium, longtime home of the Grand Ole Opry, the stage where bluegrass music was first broadcast nationwide, Elvis flunked his audition, and Hank Williams got fired. Yes, there’s legendary mojo inside those walls, but as it celebrates its 125th anniversary in 2017, the Ryman also remains unparalleled as an intimate, warm-toned setting for music of all genres. Today it’s revered as a national treasure, but 25 years ago, when it was 100 years young, the old tabernacle was a ramshackle wreck headed to demolition. Then Emmylou Harris recorded her Grammy-winning Live at the Ryman and ignited a major Music City revival. Now more than a few artists commemorate Ryman appearances by trying to capture some of that magic on live recordings. One recent release celebrates an Americana institution while another reveals a rising talent. For the Nitty Gritty Dirt Band, their 2015 Ryman concert was both a Nashville homecoming and a reunion of old friends. Filmed for PBS, where it lives eternally in pledge-drive heaven, the concert is also a 16-song CD and expanded DVD. Circlin’ Back: Celebrating 50 Years (NGDB Records) spans the full 50 years of this band and its many incarnations. No group did more to take bluegrass and traditional country music mainstream, primarily through its epochal 1972 classic Will the Circle Be Unbroken and the two Circle sequels. All of the guests on Circlin’ Back played real roles in NGDB history and forged genuine friendships along the way, including Jackson Browne, who, as a 16-year-old budding singer-songwriter, spent a summer with the band. Jerry Jeff Walker delivers an original that became the band’s breakthrough (and biggest) hit, “Mr. Bojangles,”and Vince Gill pays tribute to Doc Watson on “Tennessee Stud.” There’s bluegrass in “My Walkin’ Shoes” as well as Merle Travis’ “Nine Pound Hammer,” featuring Sam Bush on lead vocals and red hot mandolin. Despite the all-star guest list, the Dirt Band shine brightest. John McEuen’s fiddle, banjo, lap steel, and standard guitar color the music throughout. By the time they close with the inevitable ensemble singalong of “Will the Circle Be Unbroken” the CD really has come full circle, displaying the enduring talents of singer/‌guitarist Jeff Hanna, string wizard McEuen, singing drummer/‌harmonica player Jimmie Fadden, and keyboardist/‌singer Bob Carpenter. Obviously inspired, he and his Neighbors, including closest Neighbor, his harmony-singing wife Ellie, deliver a 17-song set, from wistful lost-love ballads like the opening “American Beauty” to anthemic folk-rockers like the soaring “Good Light.” Ellie steps to the front of the stage for “Hung the Moon,” which showcases her breathy, heartfelt voice. Drew and Ellie duet the contented love song, “I’ve Got You,” complete with whistling. 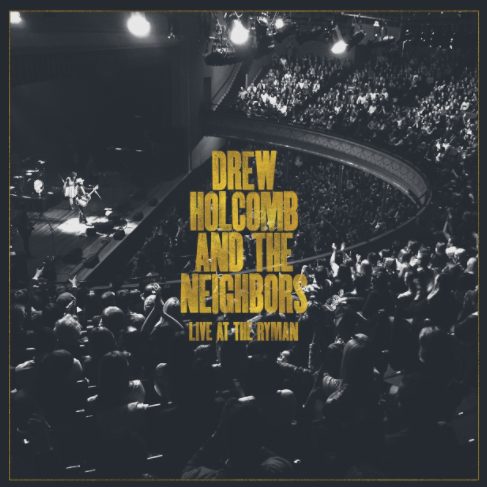 They also share the intimate “Wine We Drink,” backed only by Drew’s acoustic guitar. That quiet jewel points to the album’s greatest strength, Holcomb’s range as a songwriter and performer, creating an evening that’s part living-room concert and part arena-rock show. Holcomb stands out in these eclectic times because he’s able to casually move between genres while maintaining his own voice and vision. This is the real stuff, folks. The spirits of the Ryman were smiling that night. Pick up Live at the Ryman and you will be too.